Product #1219 | SKU EF10028LIS | 0.0 (no ratings yet) Thanks for your rating! Primarily designed for close-up shooting, the EF 100mm f/2.8L Macro IS USM from Canon is a versatile L-series short telephoto prime that is also well-suited for portraiture and other mid-range subjects. 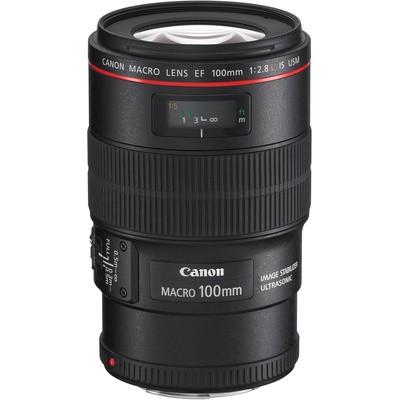 As a macro lens, however, this 100 mm offers a life-size, 1:1 maximum magnification and an 30 cm minimum focusing distance. Complementing close-up shooting, an Image Stabiliser is featured that minimises camera shake by two stops at full 1:1 magnification, or up to four stops at lower magnifications for sharper handheld shooting. Also contributing to smooth and intuitive handling, a ring-type USM and internal focusing design offers quick, quiet, and accurate autofocus performance along with full-time manual focus override. In regard to its optical assets, one ultra-low dispersion element is featured, to control colour fringing and chromatic aberrations, and a Super Spectra coating has been applied to suppress flare and ghosting for improved contrast and colour fidelity. Additionally, as an L-series lens, this 100mm f/2.8 is weather-sealed for working in inclement conditions. Ideal for macro shooting, this lens offers a life-size 1:1 maximum magnification along with a minimum focusing distance of 30 cm to suit working with close-up subjects. One ultra-low dispersion (UD) element greatly reduces chromatic aberrations and colour fringing for improved clarity and colour accuracy. An Optical Image Stabiliser helps to minimise the appearance of camera shake to better enable working in low-light conditions and with slower shutter speeds. The effectiveness of this system compensates for up to two stops of camera shake at 1:1 magnification, three stops at 1:2 magnification, and four stops at lower magnifications. Focus Limiter switch lets you constrain the focusing to three different ranges for faster focusing performance: 30 cm-49 cm, 49 cm-infinity, and the full 30 cm-infinity range.